November 28, 2011 by © Joan Miller - Luxegen Genealogy. I had great fun this weekend coordinating a kids program for 8 to 10 year olds at the Calgary Public Library entitled “Build A Family Tree Booklet”. This program was run under the auspices of the Alberta Family Histories Society. Two of my fellow AFHS PR committee members, Joan C and Don A assisted. The idea for this project arose out of a youth leadership program I’ve taught for Toastmasters. I discussed doing a family history theme with kids with Kay Clarke, former AFHS president and retired teacher. She had done a similar program at a Heritage Day event and kindly shared her ideas with me. Thanks Kay! I partnered with the Calgary Public Library for this project. 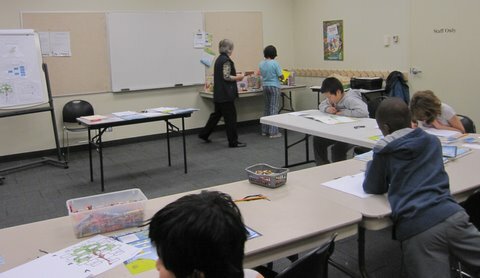 They provided the room at one of the library branches and a selection of books appropriate to the age group and activity. They also handled advertising and took registrations. We had 11 students (of the 15 registered). That was just the right number. Apparently there are often no shows for these free library programs. Joan C., one of AFHS volunteers for the project made a good suggestion that we go with older kids next time, perhaps 10 to 12 year olds. (Our group was 8 to 10 years old). I agree. Some of the younger ones struggled with the material. 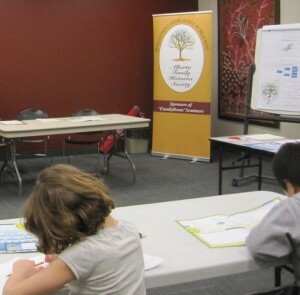 Kids building their family tree booklet at the library. We had each student label their own name tag. I did a short presentation about genealogy and family history using a flip chart at the start. I also discussed how we would build our family tree booklet. We took a photo of each student and and printed it off. This photo was their starting point (“start with yourself and work backwards in time”). The students enjoyed having their photo. On the logistics side of things it was the most time consuming part for us (and meant we had to bring a printer). It also added to the cost of the material although I felt it added to the experience for the children. The students glued or taped their photo into their booklet and started filling in the booklet (their birthdate, their sisters, brothers, their parents names, draw on the map etc). Pencil crayons would have been nice for the maps as some wanted to colour them in. (we had crayons but they don’t cut it with this age group). Robyn, our librarian got us an atlas at one point as we were debating just where Nigeria was in Africa. Thanks Robyn! There was a nice contented buzz in the room as the students worked on their booklets. An hour was about the right amount of time for this size of group and the material covered. At my request Robyn and other CPL staff who had phoned the students to remind them of the program, also asked them to bring the names of their parents and grandparents in order to have more material to complete in the booklet. Several of the students did that – in fact I think we have some budding genealogists in the group. I would do that request again. The program room at this branch library was the perfect size as was the U shaped arrangement of the tables. We had a flip chart where I spent approximately 10 minutes at the start talking about our family trees after which we dove right into the activity. We gave each student a Library and Archives Canada genealogy activity chart to take home in addition to their booklets. These charts have a 5 generation family tree chart on one side and genealogy crossword puzzles and activities on the other side. 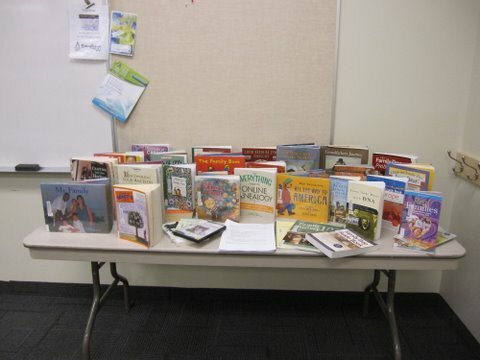 Robyn had found a wonderful selection of family tree and family history books, and put together a list of resources, all of which were displayed on a table for the students. Several students took a look and some took books to check out. One instructor and two helpers was just the right number for this size of group. The consensus is we (Joan C, Don and me) had fun. It was an interesting experience and I think the kids enjoyed themselves and learned how to build a family tree. This was a great partnership project with the library. Would I lead it again? Way to go Jean. I’ve been working on my kids lately too. Encouraging kids to get involved in Family History is so important–for them and for us. Congrats. You are very welcome. It was a fun project! Thanks for sharing your experiences, Joan, and your honest evaluation of your program. This is a great outreach idea for societies. Very nice, Joan! I have been thinking of putting together something similar and your feedback is very valuable. It seems that you had fun with it and were able to have an impact on at least a few kids. It’s so important that we, as a genealogy community, do so. We need some interested young ‘uns to take over for us someday! Its very important to encourage your child to involved the history of the family..Thanks for sharing your family experience.. It really was fun. I think I’ll do it again. I am very interested in what your booklet looked like. This would be a fun activity to do with Girl Scouts. Thank you for a good report; how it worked, and where you see improvements could be made. Well done. Really appreciate the photos! Thanks for the comment. I enjoy teaching kids about genealogy. It is a bonus if my experiences can help others teach as well. Once the Christmas rush is over I’ll do a blog post on the booklet with photos. Thanks for dropping by.